Willie Hickson most certainly had a bright future ahead of him. He was one of the children of Canadian-born Danville merchant Richard Hickson and his wife Sue M. Tyack Hickson. The couple had the means to send Willie, and possibly some of his brothers, to the now-defunct Bethel Military Academy in Warrenton, Virginia. There he would receive the education and make the connections that would give him a head-start in life that wasn’t available to everyone in his hometown. 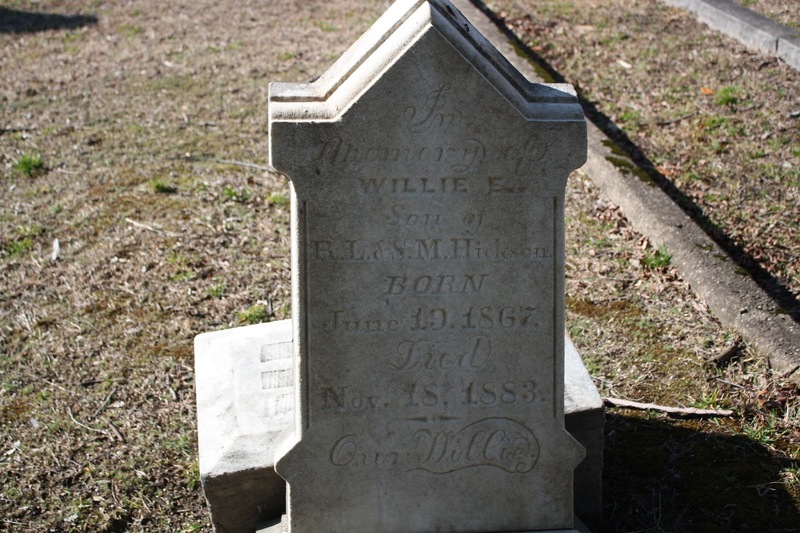 For the date of Willie’s death in November 1883, the page is missing from Green Hill’s Mortuary Reports, so I don’t know what his “official” cause of death was. Luckily there were two newspaper articles addressing the circumstances that led to his untimely death at age 16. 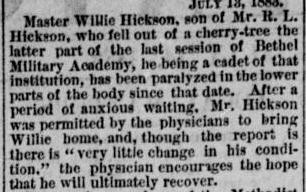 Willie had fallen from a cherry tree while at school sometime before July 1883, possibly while hanging out with friends, enjoying a break from the strict routines of military cadet life. The accident happened during “the latter part of last session” and I’m not sure what that suggests about a time frame. It could have been during the late spring, before a summer break. Willie had been paralyzed in his lower extremities as a result of that fall and while the doctor seemed to want the Hicksons to remain optimistic for a recovery, his condition didn’t seem to be improving. Willie was brought back to Danville, where he lingered until his death in November.